Dr. John Jones attended The Southern College of Optometry located in Memphis, Tennessee. He graduated in 1992 with a doctor of optometry degree. Dr. Jones performed his internship at Omni Eye Services in Atlanta, Georgia. He is a past President of the Catawba Optometric Society. 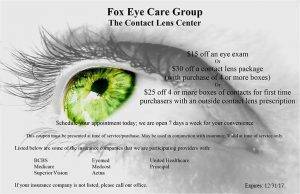 Dr. Jones joined Fox Eye Care Group in 1995 and is the fulltime doctor at the Friendly Shopping Center Location. Dr. Jones Specializes in gas permeable contact lens evaluations and comprehensive vision care for the whole family. Dr. Jones has been married to his high school sweetheart, Latrelle, for 19 years. They have three children, Lucy, Archer, and Macon. Dr. Jones enjoys outdoor activities such as hiking, fishing, and trail running with his family. He also participates in the occasional triathlon.